Pot luck Shavuot Dairy Dinner – bring a dairy dish to share. Please provide enough for a minimum of eight servings. Feeling creative? Participate in our Chopped Shavuot Challenge! Create either a sweet or savory dish that must include the following ingredients: Eggs, strawberries and/or cherries, cream cheese, graham crackers. Prizes will be awarded. How do we deal with life’s challenges and disappointments — personally, professionally and communally? Judaism has much to teach us about living effectively and meaningfully in the face of adversity and in an uncertain world and those teachings are at the heart of the Covenant that we celebrate and renew at this season of Shavuot. Together we will explore wisdom passed down to us from the TaNaKh, the Talmud, modern Jewish thinkers and Jewish literature about living life fully in a less-than-perfect world. 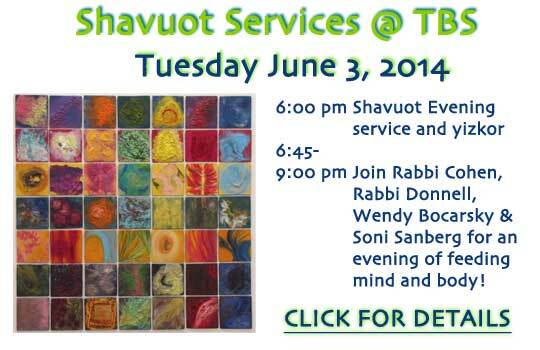 Where will this Shavout event be held? All events will be at TBS – 2625 N. Tustin Ave.